The 404 Cockpit MY, is a cockpit version of Carver’s very popular 355/356 Motor Yacht. Boarding, swimming, diving and fishing are so much easier from the cockpit, and the extra length adds a knot or two to the speed while at the same time improving the boat’s overall profile. 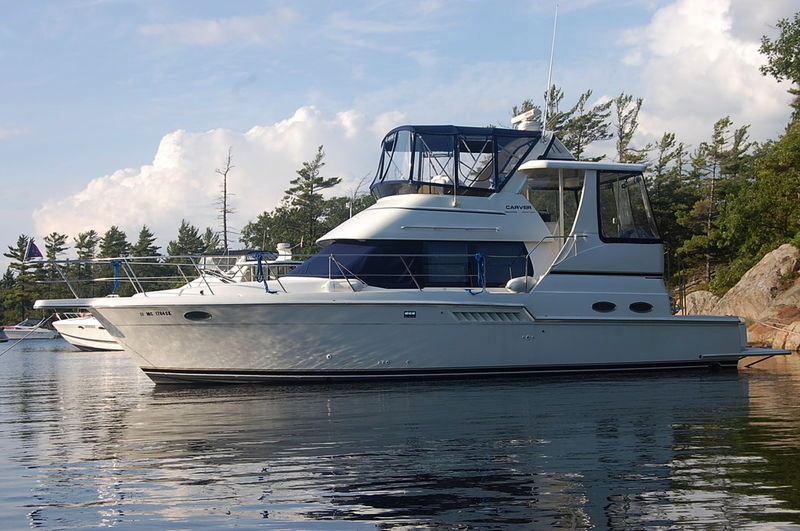 This fabulous layout has an expansive wide-open interior with huge windows, two private cabins, two fully appointed heads, and galley with full size fridge. The cleverly positioned dinette enables full view and conversation into the bright spacious salon. The aft deck with wing doors, wet bar and ice maker, plenty of room for seating, and access to the cockpit is only a couple of steps away from the well arranged flybridge area with seating for many, and tons of storage. Neutral colours, cherry wood interior, ultra leather salon sofa with incliners, and bunk over option in the V-Berth. An awesome layout with only 270 hours on the power plant. Owners have found their new boat and are very motivated.